Chinese, especially female Chinese, like to expose themselves being photographed. They place themselves right away in front of the camera and wait for the relieving pic to be taken. Often they face something around themselves in order to give an impression of being related to this or that. 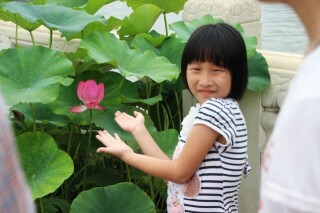 Just like the little girl being related to this beautiful lotus flower. Two aspects strike my mind almost always when I am aware of such a scene. First they expose and relate but in a more or less hesitating gesture. If you look at the hands or arms of the little girl you will see what I mean. She reaches out, or better to say remains ……… in the gesture of “beginning reaching out” but does not really reach the object. Secondly her body, that means her shoulders, hold completely back her movement. A movement which is based on an inner impulse which is indicated by this hesitating gesture. Finally if you watch the girl`s face you are aware of a glimpse, an expression in the eyes which indicates not feeling well at all in that moment. She just doesn`t like it. Remembering my experiences with Chinese this often is to be seen. So I ask myself what on the one hand is the background for such an expression. And what on the other is the function of this expression. Function for the individual and the social function. – More about it later here, perhaps in some days.